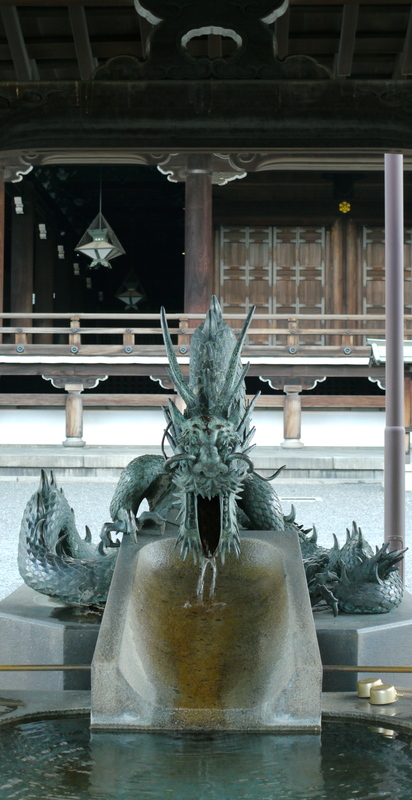 The Gilded Teapot > Blog > Archive by category "Japan"
And so from Kagoshima we travel to Kyoto. Another sun drenched ride on the Sakura Shinkansen through the mountainous countryside of southern Japan takes us to the country’s former imperial capital, giving us time to find our hotel and unpack before we head to Wazuka the next day. We take a sunny early evening stroll around the aquarium and back streets, before ascending through the levels of Kyoto central station to visit a Sukiyaki restaurant, Moritaya, for dinner. The views across the city – and the meal – are breathtaking. The next morning is another bright, glorious early start – we make our way to the central station to take a mixture of train and bus to the mountain valley town of Wazuka south west of the city. This particular region, including Uji, is Japan’s oldest tea growing region, with a history stretching back hundreds of years to the 13th century. Wazuka sits in a river valley, with mountain ranges arching up to each side – and everywhere you look, even steep, rocky outcrops, are small tea fields hugging the sides of the mountains. 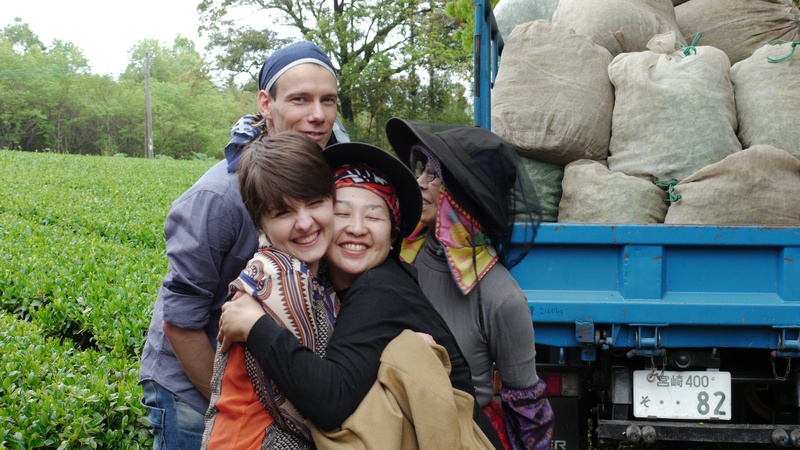 We are here to visit a cooperative of tea growers working together in Wazuka to grow and process their tea without the intervention of larger companies – just like Shigeru and Haruyo in Miyazaki. 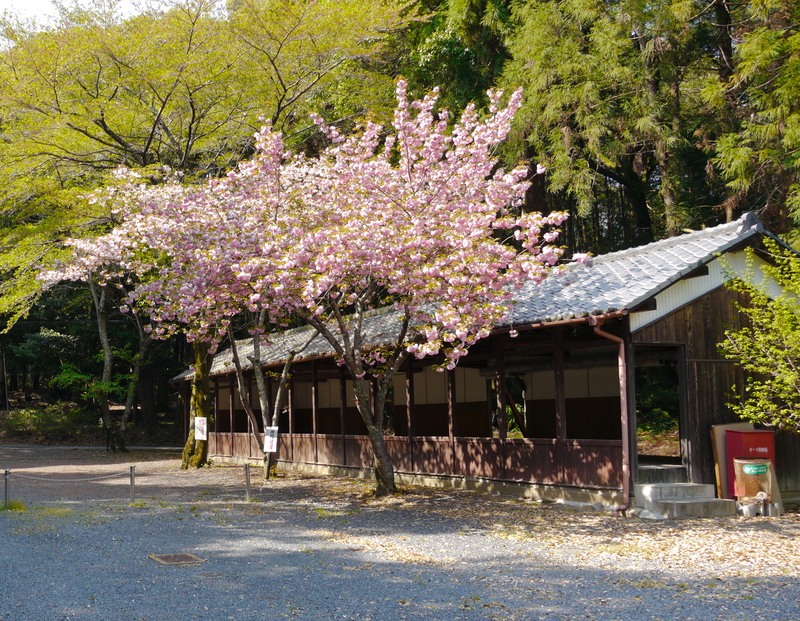 We take the bus through the valley and walk past the local shrine, surrounded by late season cherry blossoms, to meet our friends Matsu and Simona. The day is warming up quickly, so we share some ice brewed gyokuro tea before heading out to the tea fields. 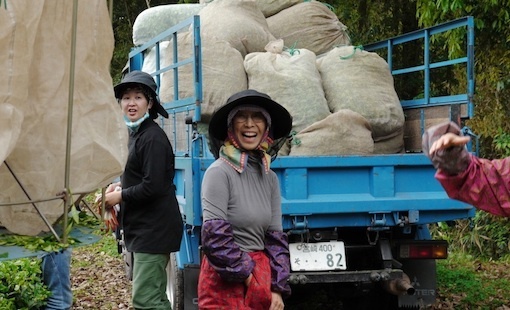 In Miyazaki in southern Japan the harvest had already begun – but Wazuka’s was still waiting to begin. Being further north, this region’s leaves were a little behind the south. Something else you might notice – the tea bushes at ground level in the Wazuka valley are much brighter in colour than those at higher elevations up the mountainsides. Why is this? The freshly growing leaves take a little longer to mature at higher altitude and will be ready for plucking towards the end of the season, rather than the beginning. 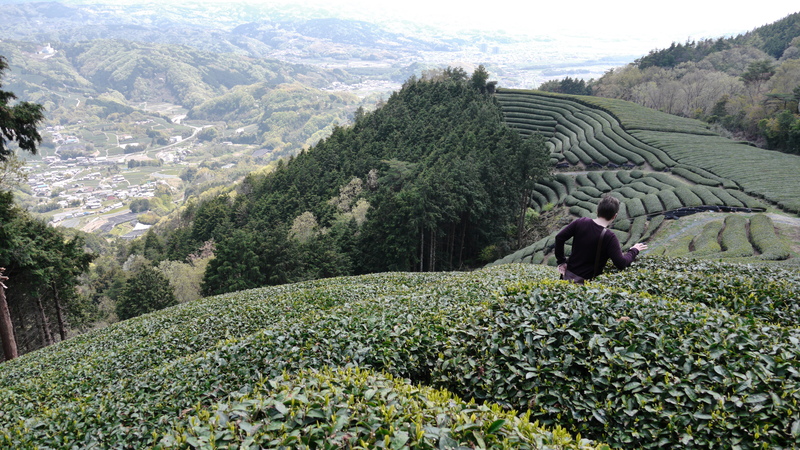 Matsu takes us up the winding mountain roads to over 600m above sea level into the cooler mountain air to one of his highest altitude tea gardens. The forest gently rustles in the breeze as we walk through the rows of tea bushes to taste the freshly growing leaves and admire the view. The mountains stretch mile after mile into the distance, each one home to a small tea field or two as far as the eye can see. Matsu smiles and tells us they call this the heavenly tea field, but when the harvest it, it is hell! The steep slopes call for picking by a hand operated machine, but leaves are not quite ready yet, so for now we will enjoy the view. We drive back down the mountain past tea fields and wild bamboos as Matsu navigates us down the steep narrow roads – Rob asks is he would have liked to have been a rally driver “Yes!” shouts Matsu. I must admit, he was pretty good round those corners… At the foot of the mountains we explore the lower level tea fields, almost ready for harvesting. 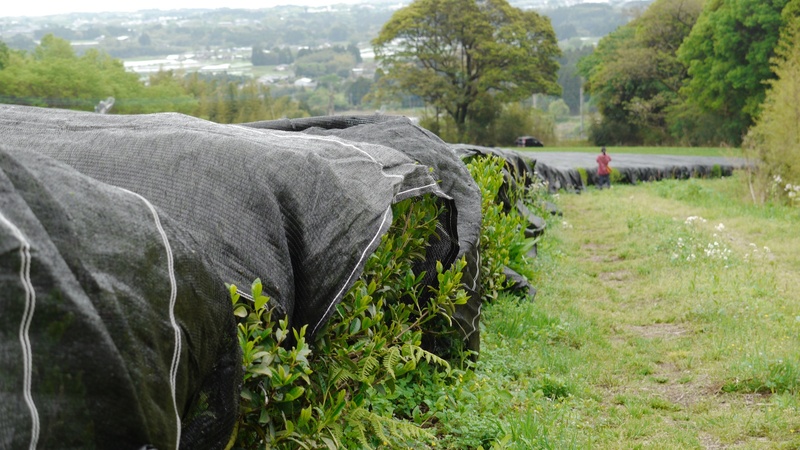 Here we see shaded tea bushes, like Shigeru’s, growing tencha for Matcha production, mostly the Yabukita cultivar. 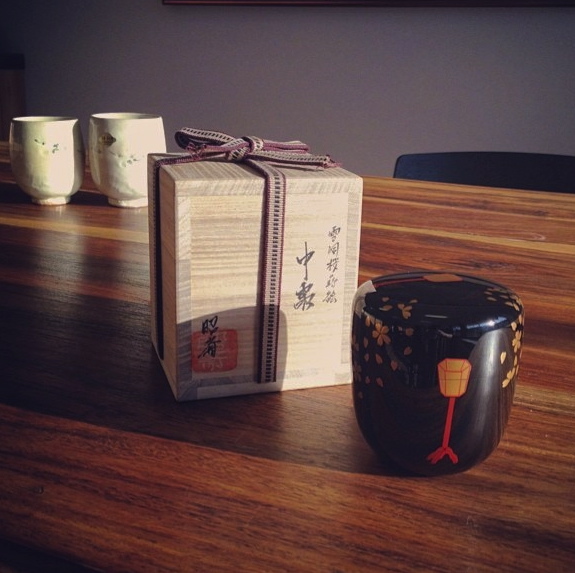 Look out for our upcoming post on Japanese tea processing and varieties. We return to their tea house to taste some more of the teas that they produce. Then, Matsu turns around and suddenly puts an old granite Matcha mill on the table – something I had been wanting to see for a very long time! He let us grind our own Matcha on his own mill, making a turn once a second, then drink the freshly ground tea powder. Sweet, vibrant, and grassy, the Matcha is wonderful. 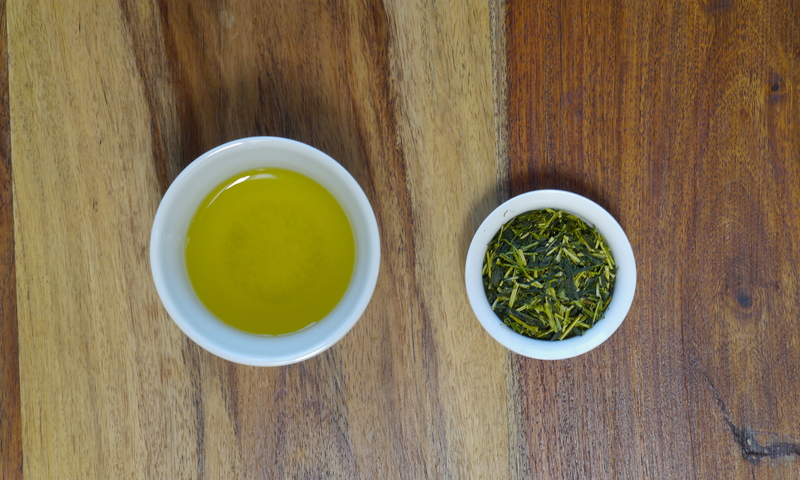 We were very taken with their Sencha Genmaicha – a spring Sencha green tea blended with toasted brown rice. Keep an eye out, this year’s fresh harvest will be joining us soon! We enjoy a late lunch in a little noodle place near the shrine. 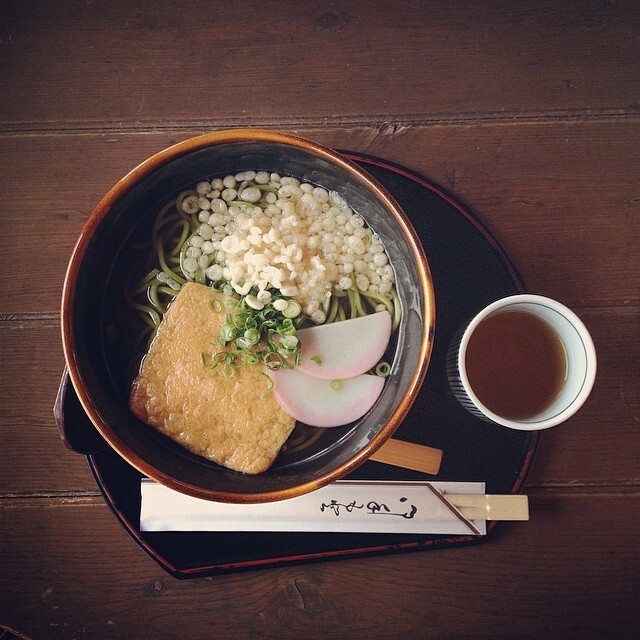 Sitting out in the sun, we enjoy big bowls of Matcha cha soba and cups of hojicha tea. After a few more pots of tea the afternoon air takes a cooler turn and it is time for us to to travel back to Kyoto. We arrive back in the early evening, and tuck into some Katsu and cold beers for dinner. We have the whole of the next day to explore Kyoto – the weather is hot and sunny once again, and visiting a tea house for a tea ceremony could not have been better timed. 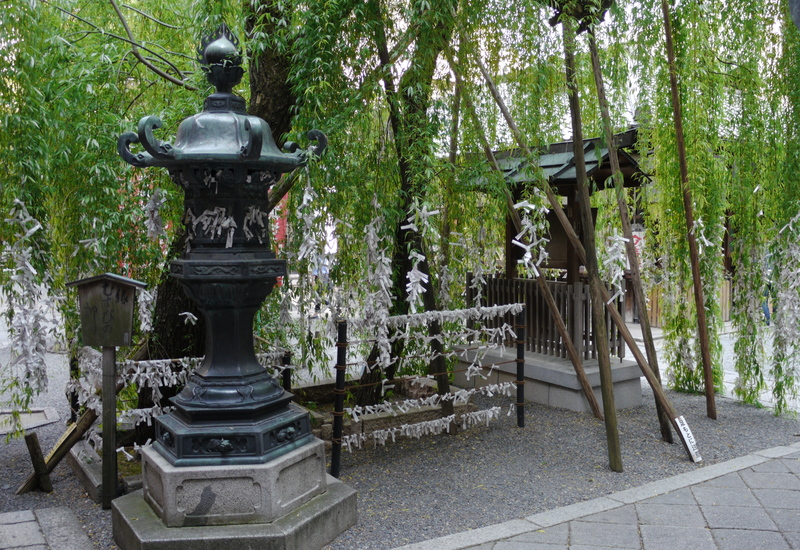 In the centre of the city we find a cool, quiet shaded courtyard with a small tea ceremony house next to a koi pond. The tea master takes us through the steps of the ceremony, and invites us to whisk our own Matcha in the calm, quiet atmosphere. With every touch of her hand on the tea scoop and chasen, it touches you like a gentle hand on your shoulder. Refreshed, we head to visit a tea shop in an arcade (something our tea shops have in common!) called Horaidos. Run by 4th generation tea masters, the shop sits in an old building that a new arcade has been built around. Everywhere are piles of papers, lists of tea, boxes, and tea caddies stacked all over the back of the shop. Behind a pile of papers and boxes we spot a row of meter-high traditional Japanese tea urns, where the weight of the tea itself inside was the element that kept the tea fresh. I am taken with a Matcha Natsume and pair of drinking cups – we speak with the specialist who explains that the Natsume’s name translates as “Lanterns on Cherry Blossoms at Night”. As night falls we head into Gion to find somewhere for dinner, and just off one of the main roads we decide on a tempura place. 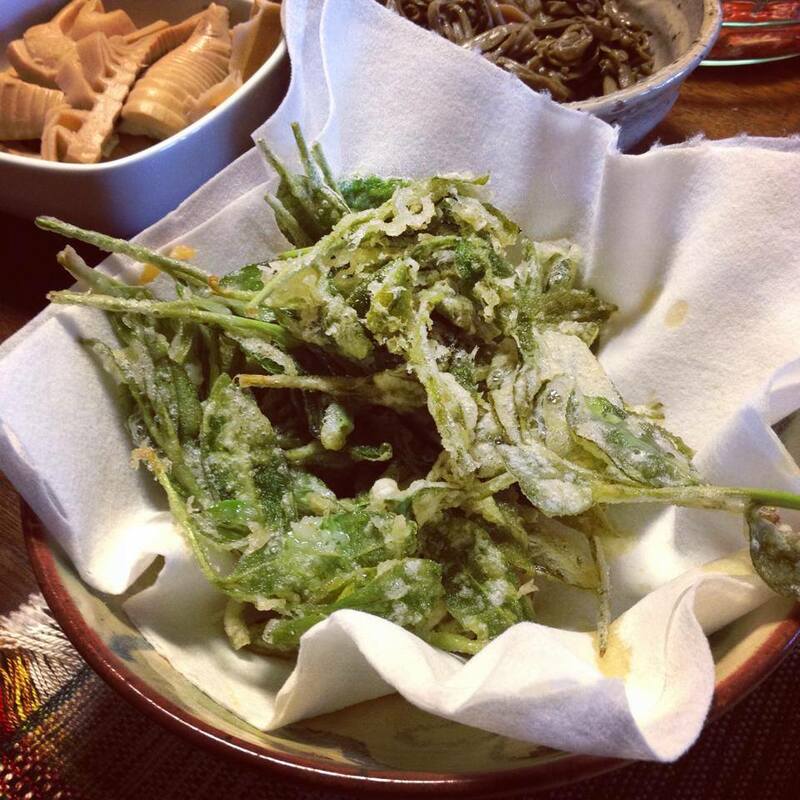 Cold sake, tempura, and green tea – perfect! We take our time walking back across the river, and a side street, Ponto-cho, filled with red lanterns catches our eye. As we head down the alley past bars, rows of lanters and small restaurants, we see a bar window full of jazz covers- on the door it reads “Hello Dolly” a jazz and cocktail bar. How can we resist? Inside is exactly how you would imagine a speakeasy. A long, dark bar lit by tassle-edged lamps with small tables and Art Blakey playing in the background. We’re told a quartet is playing that night, so we order martinis and stick around. We are glad we did – you’ll hear the group playing a great version of “I Remember You” in our video. I fell a little bit in love with the pianist, she was sublime. A few more cocktails later, we head back to bed. 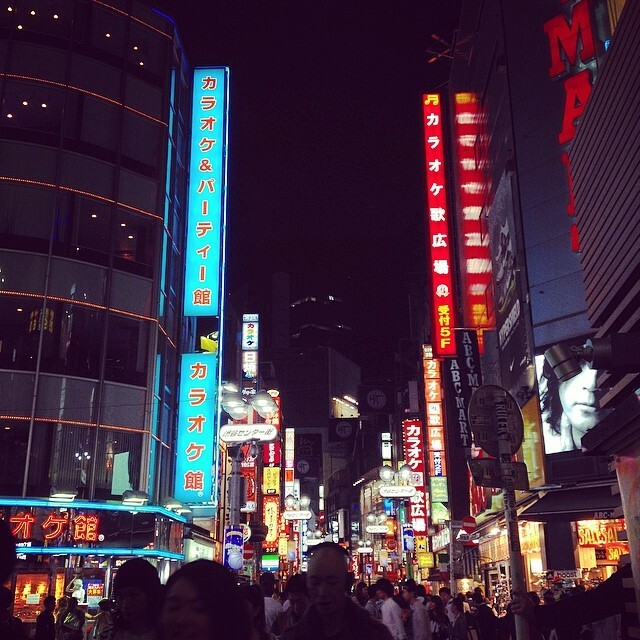 When we’re done with zombies, racing and rides we head back to Ginza and into Hibiya to visit a certain special someone. Godzilla. A little smaller in real life. 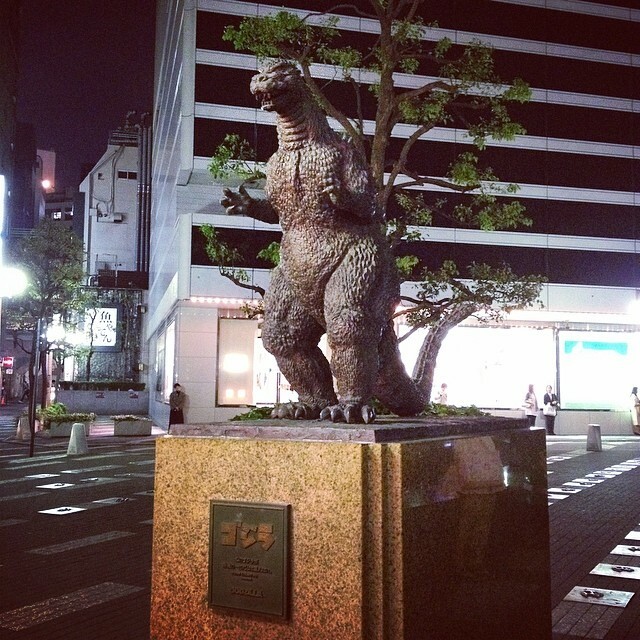 Hibiya is home to Tokyo’s Godzilla statue, marking the spot where this iconic lizard is taken down at the end of the 1954 movie. I also pick up an old (and slightly broken) Godzilla figurine to take home. He now takes pride of place on my desk next to my tea caddies and books. The last restaurant we visit is a lovely Sukiyaki and Shabu Shabu place in Ginza, where we try our hand at cooking snow crab and enjoy some melt-in-the-mouth sashimi. We finish our cups of sake, and head back to the hotel ready for an early start back to the airport the next day. Make yourself a cup of tea and take a look at the video of our trip – and subscribe to our new channel! In late autumn last year we received an invitation. Through our recent explorations and discoveries in Japanese teas, we were bowled over by an invitation from the small family run tea garden in Miyazaki – the creators of the Sencha Superior – to not only visit them and their tea fields, but stay with them in their home. Well, how can you refuse?! 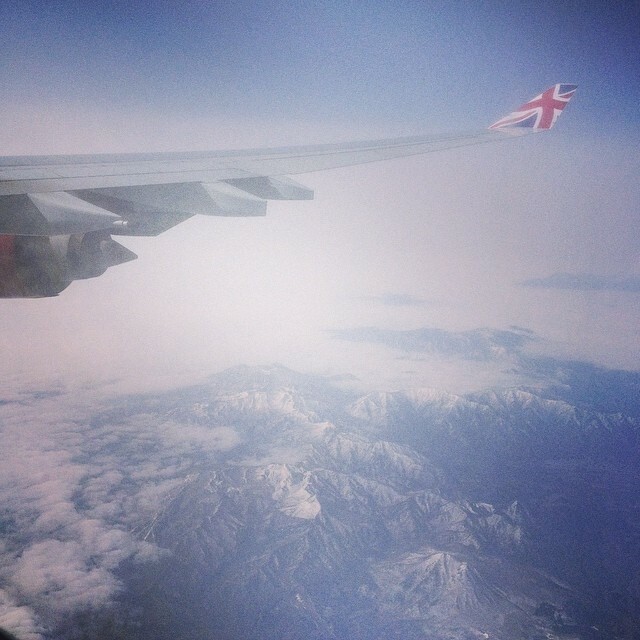 We found ourselves on Easter weekend on a direct flight from London to Tokyo, ready for 24 hours of non-stop travel. 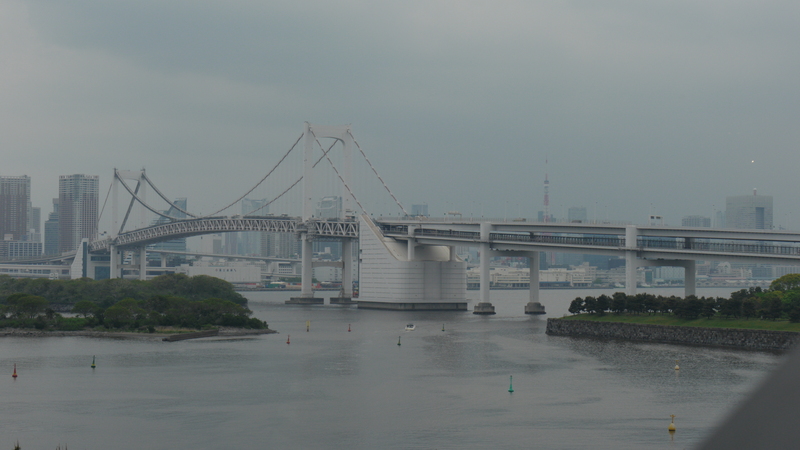 After 11 and a half hours in the air, we landed at Tokyo Narita the following morning. The approach is beautiful – after hours over the Siberian tundra, the flight takes you over the mountains of northern Japan before approaching the airport over mirrors of rice fields. Through customs and luggage collected, we took the connecting NEX train to the colossal Tokyo central train station, a multi-floored giant handling over 3,000 trains a day in the centre of the city. From here we boarded the Shinkansen that would take us from Tokyo all the way to Kagoshima in the south of Kyushu (with a quick change in Osaka). We were fortunate enough to travel on a beautifully clear day, and seeing the Japanese landscape hurtle by at 150 miles per hour really was something… From the centre of the Kyoto metropolis, we made our way to the countryside of southern Japan. At 9pm tired and jetlagged we arrived in Kagoshima, a quite spectacular coastal city built around an island volcano – but no time to stop! 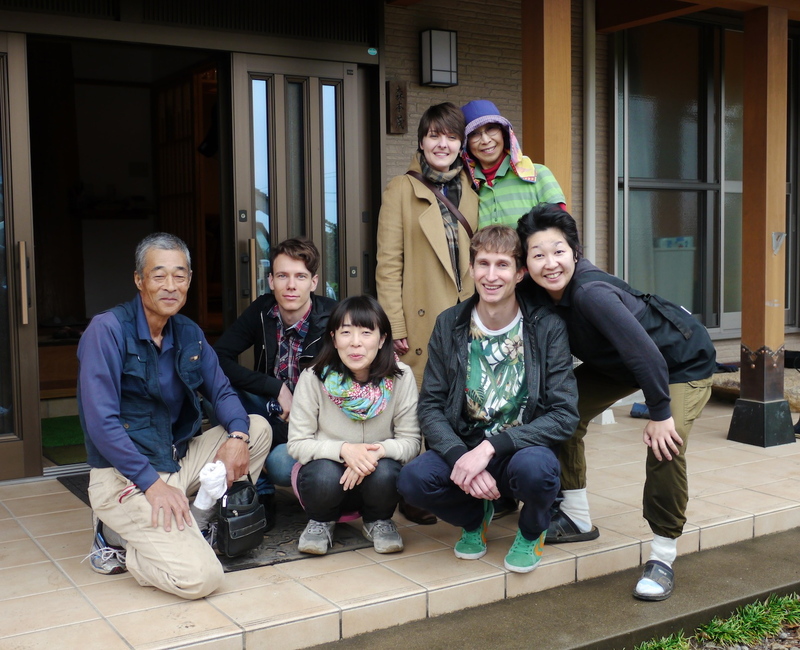 At 8am the next morning we were on a train headed across the island for Miyazaki to meet Shigeru and his family. Rural Miyazaki is a stunning place. The rich, volcanic soil is ideal for cultivation, covered with lush green vegetation mingled with all kinds of fruit farms, vegetables and – most importantly – tea. 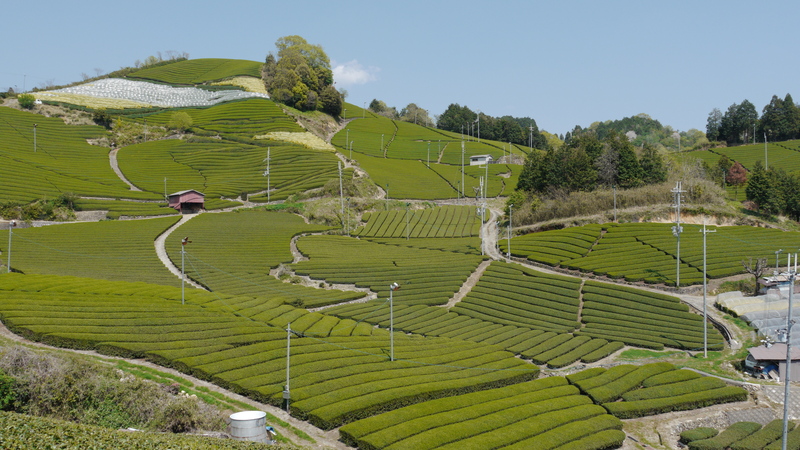 Shigeru, Haruyo and their family have small tea fields dotted around their home running right up to their front door. They grow several different varieties of the tea plant, notably the Yabukita and Minami Sayaka cultivars, each one containing different balances of sweetness and bitter notes in their biological makeup. 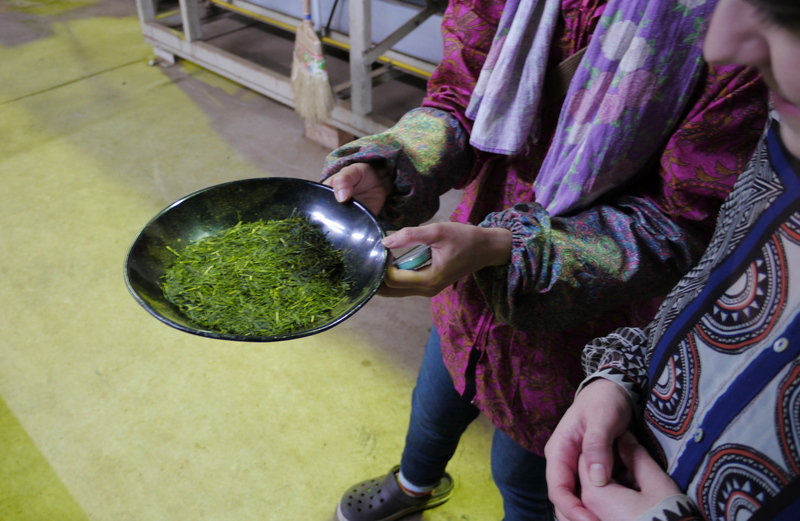 After drying, Shigeru and Haruyo decide how to blend these and other varieties together to create their perfect Toku Jô (extra-superior) Sencha. The first spring harvest had begun just a few days before we arrived – the weather was clear, so after a delicious lunch of okumidori and local produce, including Haruyo’s home made white miso, we set out to the tea fields to see the harvest in action (and pick tea leaves with Yoko to make tempura for dinner that evening). You will always be able to tell a Japanese tea garden from the gently domed tops of the tea bushes that rise and fall in waves across the tea fields – and there’s a very good reason for this. 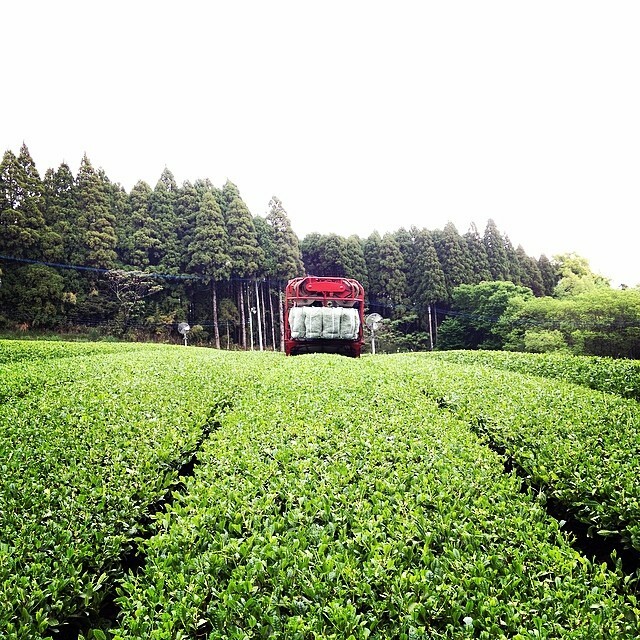 Rather than plucking the leaves by hand, the preferred Japanese method is to use a tea harvesting machine. These can be driven (like Haruyo’s above) with collecting baskets on the back, or operated by hand being pulled over the tops of the tea plants – these are best for tea fields on steep mountainsides. This means harvests can be collected quickly and precisely when the leaves are at exactly the right stage of growth for plucking – if this was done by hand, the costs would be astronomical, so using harvesters allows small producers greater freedom without sacrificing quality. What are the fans for? You’ll see in our video the gently spinning fans spread through the tea fields – and they serve a very specific purpose. Frost can cause many problems for tea gardens, and if a cold spell is particularly fierce, it can have a terrible effect on the tea farm. However, these fans pull warmer air from above the garden towards the cooler ground, helping to regulate the air temperature surrounding the leaves. Once the harvesting bags are filled, the fresh leaves are taken to the small tea processing plant just a few meters from their front porch to be steamed, rolled, dried, and sorted. After removing your shoes for sturdy clogs outside the door, you can enter the factory. The first thing that you notice is the thick, sweet smell of steaming tea leaves in the warm air – not unlike freshly cut grass. From here the steamed leaves are cooled, rolled, dried, and sorted, with the whole process taking around 4-5 hours. 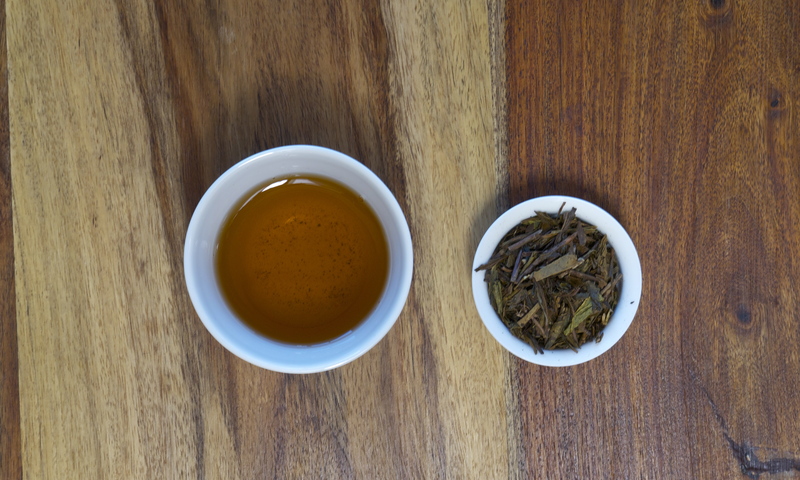 We were able to infuse and sample the raw tea that was picked that morning after its first processing – and the leaves were still warm from the factory. 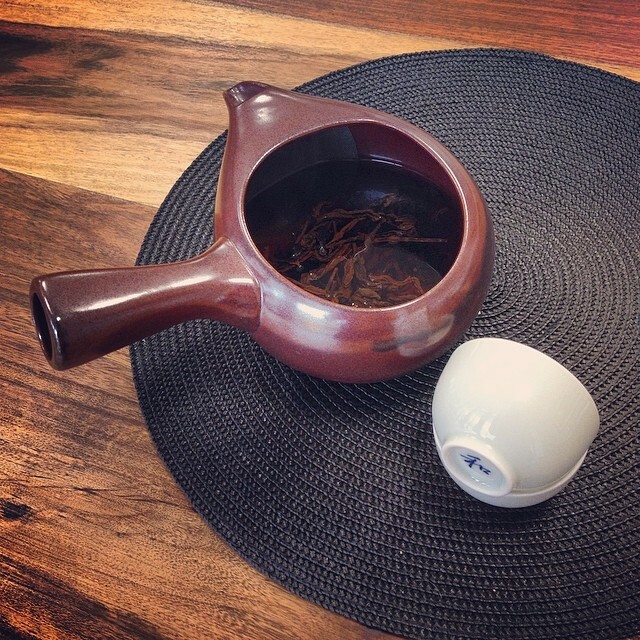 No part of the tea leaf is wasted. Over dinner that evening, Shigeru explained how even their lower grade leaves that would not normally be used are turned into a basic Matcha powder which local farmers add to their animal feed as a natural supplement. The fertilizer from these farms are then used in the soil of the tea garden, creating a natural cycle through the seasons. The family’s pride in their fully organic methods and careful production, their enthusiasm and dedication to absolute quality is an inspiration. At about 6pm jetlag began to catch up with me, and what was intended to be a quick nap on their wonderfully comfortable tatami mats turned into a full sleep until 9am the next morning, lulled by the gentle hum of the processing machines. Awake (and a little embarrassed at having slept so long – the family found it very funny!) we settled down for a pot of green tea and a plate of natto. The clear weather of the day before had given way to rain which, although it meant that harvesting couldn’t happen that morning, we could all set out to a local ramen place for lunch. Pork miso ramen… Oishii! The rest of the afternoon was spent swapping tea stories, and chatting about the differences between the Japanese and English approaches to tea over the kitchen table. Shigeru was very interested in the differences between Japanese and English water, and the effect that the different minerals have on tea’s flavour. For instance, in Japan, Matcha can be made with near-boiling water. 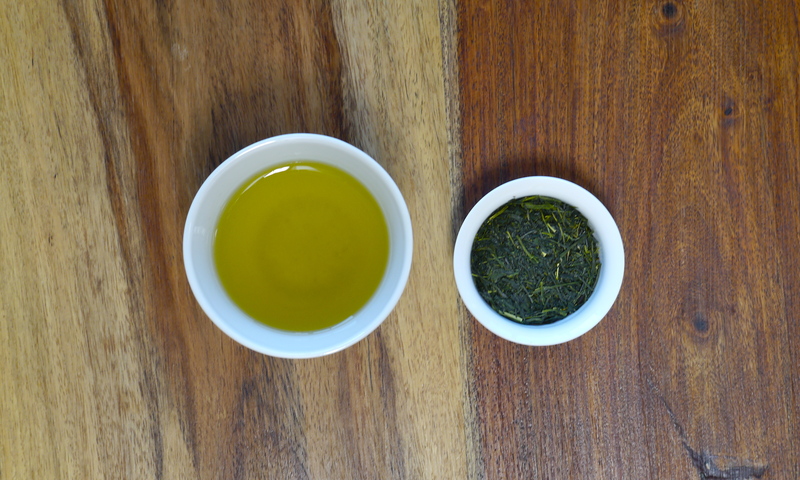 However, the same Matcha tea in England needs a sweet spot of between 65-75 degrees, or the resulting infusion can be incredibly bitter, purely through differences in the water used. The hard, mineral rich water of Dorset is very different to the soft, sweet and purer water of Japan. It was very sad to say goodbye, and after many hugs it was time to hit the road again. We headed back to the station at Kagoshima* to take us to our next stop: Kyoto. Read Part 2 of our trip right here. *we arrived late in the evening, and when one of the receptionists heard we had been to a tea farm, she gave us a packet of Gyokuro tea to take home. Thank you, JR Hotel Kagoshima!